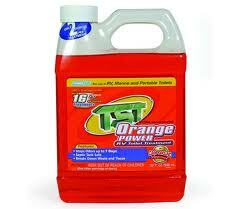 Camper Toilet Treatment-TST Orange Power- 32oz. RV Holding Tank Deodorizer -TST Orange Power- 32oz. Camper Toilet Treatment -TST Orange Power- 32oz. TST, Total Sanitation Treatment, is manufactured by Camco and has been providing RVers with superior camper holding tank deodorizers and RV toilet treatments for over 40 years. 2 ounces treats 40 gallon tank in any season. 32oz. bottle provide 16 treatments.